We all have our natural tendencies and habits. The things that come easy to us, and because they are easier, we tend to overdo them. When students first come to yoga, they may fall generally into two categories: strong and stiff, or more flexible and loose jointed. Over time, and as your yoga practice deepens, you will discover you are, more accurately, loose in some areas and strong in others. 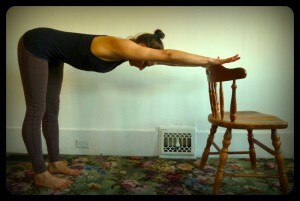 Certain poses will be useful for stabilizing these loose areas, and other poses will create space where you are tight. The refined work becomes discovering this fine balance through the subtle work you do within the poses. Press your hands onto a table top or back rung of a stable chair, shoulders width apart, and walk back until your legs are upright, your torso and legs making a 90 degree angle to each other. Have your feet hips distance apart. Press your feet down to lift your knee caps and thigh muscles up and strongly press the thighs from front to back. Simultaneously, imagine you are squeezing a block between your upper legs to gather the outer legs in. Press your hands down, spreading your fingers and palms wide. Firm your upper arms, and straighten your elbows, drawing your shoulders and shoulder blades towards your hips and into the back to widen the front of your chest. Keep your ears in line with your upper arms, (don’t let the head hang down towards the floor), the back of the neck should remain long. From the thighs pressing back, stretch the crown of your head towards your hands and get even longer in your waist, making space between each vertebrae. When you find this quiet place of balance and stability, you might notice the abdomen naturally lifts and spreads toward the lower back. Hold the pose for 1-2 minutes with steady breath through the nose. To come out, bend your knees, maintaining core support and walk your feet towards your hands, place your hands on your hips and stand up. Take a moment to feel the length of your spine, the space and the stability once again. Whether you consider yourself “flexible” or “stiff”, there are many benefits to discover from a longer hold in poses like Spinal Stretch. The looser students will gain necessary strength, endurance and stability, while the tighter students will find more space in the backs of the legs and the upper back. This pose is a great preparation for downward facing dog, adho mukha svanasana, and is also useful for re-creating balance in the body after something asymmetrical like a twist.